Family tradition has it that James and Dolley Madison used this room, which also may have been used as a sitting room, during their frequent extended visits. The alcove bed has a closet overhead. Another closet, one of few full-sized closets in the house, is shaped as a triangle to complete the room's octagonal form. The room also has a triple-sash window�used in many rooms on the first floor�that served as a doorway in addition providing light and ventilation. The interior shutters, also used in many of the first-floor rooms, can be closed for privacy and insulation. Color French wallpaper -- the original trellis pattern has been reproduced. 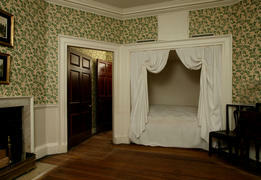 Jefferson purchased wallpaper for other rooms, but researchers have not yet found enough evidence to reproduce it.